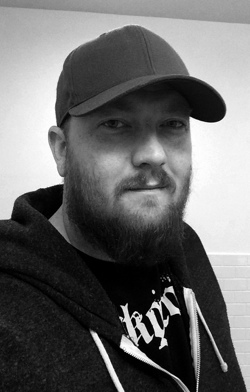 Continuing the series of interviews with designers and artists that bring user interfaces and graphics to the big screens, today’s I’m excited to welcome Chris Kieffer. His work spans multiple films and TV shows, from Chuck and The Mentalist on the small screen to Man of Steel, Pacific Rim, The Cabin in the Woods, Green Lantern, In Time, Inception and Surrogates on the big screen – just to really name a few. His latest production, Transcendence, is playing in theaters now, with widely anticipated Interstellar out in theaters in November 2014. In this interview he talks about the initial exploration and research phases upon joining a new production, the frenetic pace of both TV world and feature film world, designing for mixed form factors – from phones and tablet handhelds to a set that spanned 200 screens, striking the balance between the technical nature of real-world computers and designing interfaces that flash gigantic red warnings across the entire screen, differences between TV and feature productions, and his work on the just-released Transcendence. Chris: I had been a designer for a while before I got into the film/television industry. I was doing a wide array of things – print work, ads, packaging design, t-shirts, etc. I was also doing a lot of motion graphics work, commercials, animations, etc. I really preferred motion graphics over print graphics. I liked being able to bring my designs to life with animation. Something about that really made it fun and challenging. So I pushed to do more and more motion graphics work instead of print. I had an opportunity to do some motion graphics for a film, and during that they needed some help with interface design. I told them I could do it, and the rest is history. 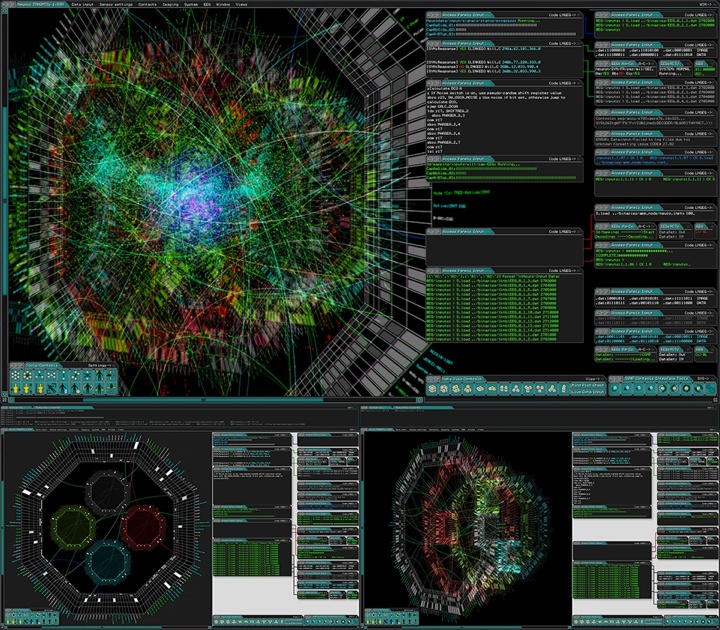 I have always been interested in interfaces, GUI’s, FUI’s in movies and television shows, but never thought I would actually be designing them. Kirill: Where does your involvement with a particular production usually start, and who do you work with? Chris: Every film/TV show is different. If I’m lucky, I get involved early in production. I usually meet the production designer, art director, and the director to breakdown the script and talk about the overall designs of the film. Sometimes, I work with prop master when designing interactive graphics for a physical prop/device. Other times I get thrown in at the last moment. Literally I could get a call for a whole control room that shoots in a few days and they need 20 or more screens with content. Then I get into the post-production side of things. I do a lot of screen replacement and VFX work too. So I deal with VFX supervisors, VFX editors, directors too. The set of “Live Free or Die Hard“. Courtesy of Chris Kieffer. Kirill: Do you prefer having a full artistic freedom for a project, or a more well-defined direction? Chris: Both. I like when they have an clear idea of what they want, but are open to me coming up with my own concepts based on their ideas. Kirill: What are your thoughts on the term “Fantasy UIs”? How well does it capture the essence of what you do? Chris: I like the term. When designing an interface, you have to fantasize what this would look like and how it would work in the world of that film. Kirill: And on a related note, how do you stay a step ahead of all the advancements in consumer-grade devices and sensor-based gadgets these days? Chris: I can’t stay ahead, I just keep in touch as much as I can. As soon as you learn or read about some new technology that’s coming out, there’s already a newer one in the works. But I try and find new things as much as possible. Sometimes it’s about understanding the technology we have now, and how do we make it better. Kirill: In “Live Free or Die Hard” and “Cabin in the Woods” you worked on interfaces that are not supposed to be futuristic. Is there less challenge involved in that? Chris: It’s not really easier making all the content, but as for designing the interfaces it can be. In Live Free or Die Hard the FBI Headquarters was a standard interface, which made it easier to design and animate. The challenge was the massive amounts of screens and content that had to be made while shooting. In Cabin in the Woods, they didn’t want it to be a standard interface. They wanted it to be a mix of old and new. If it isn’t broke, don’t fix it. That was the idea of that control room. They had old computers mixed within new, as if they added new things when they were needed but left the old stuff because it worked. The screens of “Chuck“. Courtesy of Chris Kieffer. Kirill: Do you enjoy designing for mixed form factors, like handhelds for “Chuck” or analogue monitors in “Cabin in the Woods”? Chris: Both. Each one has its own set of challenges. The device sizes and screens are always changing, along with the operating systems. One device could be an Android system, the other an iOS device or Microsoft tablet. So you have to be able to build for so many different devices. But they can look like really cool gadgets when your finished. On the other hand when you get big screens, you get to do really nice looking interfaces. Then you get to watch actors interacting with them on set, is pretty cool. Kirill: How much time do you spend researching a particular environment (say, power plant or air traffic control rooms)? Chris: A LOT! LOL. I really like making it look as real as possible, unless it’s supposed to look different. Even then, I still research a lot. I like knowing how they really work and how they are controlled. It helps when designing the interface, and determining how the actors will interact with it. When I did The Taking of Pelham 123, we actually got to go see the operations in action. Watching how they control and monitor all the subway trains in New York, it helped so much watching how it’s really done. Then I still went and did research. I had to learn how the trains work, where the tracks are, train schedules, etc. Before / after stills from “White Space“. Courtesy of Chris Kieffer. Property of White Space, LLC. Kirill: Do you first outline your sketches on paper, or go straight to modeling software? Chris: I almost always start on paper, but abandon it quickly. I have to figure out if the idea/sketch I have will even work, so I jump into software. I do design a lot in Illustrator and Photoshop, while I’m problem solving. Kirill: Is there a need to become increasingly more meticulous with advances in shooting and projecting / playback equipment? Chris: Like I said earlier it’s always changing. So I try to learn and evolve constantly. You have to be ready to adapt to anything. Kirill: Between on-set shoots that are tied to presence of actors and post-production that is tied to release schedules, what’s more hectic? Chris: On-set is more hectic to me. Don’t get me wrong, there are some rough times during post production. On-set is unpredictable to a point. Something could go wrong with a piece of equipment during a shot. You may only get one chance to shoot something on-set vs. getting to do a couple of revisions in post. Making it happen exactly when it’s supposed to every time, even when actors or directors change it on the fly. You have to make changes and get it ready in-between takes. I guess it’s a lot more pressure dealing with on-set graphics. Kirill: How do you strike the right balance between staying true to the technical nature of computer interfaces and making appealing visuals for the aesthetic purposes of the overall production? Chris: It’s tricky. Sometimes I will make it as real as it gets, other times you have to change it to be what they want. For example, if you put in an incorrect password in your email it might say something along the line of… Incorrect Password, Try again, Invalid Password. But the director might want it to be a huge animated popup window that says “ACCESS DENIED” in red. Now we know that never happens, but they may be trying to get a story point across in a fraction of a second, so you have to compromise. Then there are times when they want the interfaces to be really dense and full of information, but mean absolutely nothing. So in that instance you can design something that looks great but doesn’t really mean anything. Then there’s the time part of that. You may not have weeks to make a realistic interface the way it should be. You may only get a couple of hours or days to make something. Kirill: How would you compare working on episodic TV to feature films, in terms of budget, scope, technology at your disposal on-set and in post-production, and your overall place in the production? Chris: Well that’s a big one, I’ll have to break it apart. In terms of budget. Films usually have a much bigger budget than the TV shows. But TV can be just as demanding as a film in the scope of work. Sometimes a pilot may have a much larger budget than a normal episode because we have to create everything from scratch. After that there is usually an average that they want to spend every episode. I have worked on some films that have had lower budgets than a TV show, which is challenging. I usually have to figure out new or different ways of making it happen. Technology on-set can vary. On a show like “Chuck” we always had new gadgets and toys to play with. On a show like “Shameless” it’s just what the average person would use, like a laptop or phone. In films there can be a lot of technology at my disposal. It really depends on the need. If they want something a specific way, then I get to work with some pretty cool stuff. Sometimes I’m designing graphics that will be rear projected across six HD screens over a hundred feet and they have to be running in sync, and triggerable by us or the actor. The screens of “Taking of Pelham 1 2 3“. Courtesy of Chris Keiffer. Then there are times I have to make a simple interactive website on a laptop, so in can vary greatly. On “Surrogates” we had one set that had over a hundred computers feeding two hundred screens and around thirty different feeds at the controllers desk. It had to all be in camera, it would have been too expensive to replace them all in post. They made some changes in post and I ended up changing a bunch anyway. LOL. The screens of “Surrogates“. Courtesy of Chris Kieffer. My overall place in production is different on each project. On some films I do everything from supervising all the video playback graphics to just building content that goes to set. Sometimes it’s nice just designing and animating, because I can focus all my attention on that and really get into it. When I’m supervising, I have to do that and also know the schedule, go to all the meetings, be on set, make changes, delegate who’s doing what and so on. It really makes it hard on the designing and animating process. Luckily I have a few amazing artists who I usually work with, that really makes a difference. We have done enough projects together to know what our strong points are, and how to get things done quickly and efficiently as a whole. I also think as an artist you can grow so much when you collaborate with other artists. Kirill: What are your thoughts on the increasing number of stereo sci-fi productions, and how is that affecting the type of projects that you’ll be working on in the next few years? Chris: It doesn’t really affect me during production, in post it can. Like in G.I. Joe: Retaliation they wanted me to fork on some shots that had overlays. High tech HUDs and make them for 3D. It changes the workflow and design when building it for 3D. Besides that I don’t mind. The interface overlays of G.I. Joe: Retaliation. Courtesy of Chris Kieffer. Kirill: Going back to the real software that you’re working with on the daily basis, what are the main pain points you’re seeing there? Chris: I use pretty much what most people use – Aftereffects, Cinema 4D, Illustrator, Photoshop and others. If I run into a problem using one software there is always another that I can use to solve the problem. I really like that part of it, trying to do something that hasn’t been done before. Kirill: And on a related note, where do you see the field of human-computer interaction going in the next 10-15 years? Still from “White Space“. Courtesy of Chris Kieffer. Property of White Space, LLC. Kirill: What can you tell us about your latest work? Chris: Not as much as I want to. I recently finished working on Christopher Nolan’s Interstellar. I can’t say much, but I really enjoyed what we did on that film. After its release I will do a breakdown of everything we did on that. I can’t wait!!! I also worked on Transcendence before that. We had a mix of everything on that film. Modern computers, old computers with CRTs, projections, holograms and so on. We talked about research, and this is a great example of that. In the beginning of production I sat with the Director Wally Pfister and production designer Chris Seagers to discuss what they wanted to do. They were open to ideas as well. So I came up with some concepts and went from there. I sat it many long meetings talking with professors of electrical engineering, computer science and neuroscience from Berkeley to really understand the technology behind the film. Understanding concepts and ways of how to actually map out human thoughts and memories to a computer. I had to learn about nerve impulses, neurotransmitters, and how they can be mapped into a system that can use and store that data. Then try an communicate that on the screens to the audience. The screens of “Transcendence”. Courtesy of Chris Kieffer. There were the hi-tech labs too. I had to learn a lot about nanotechnology and robotics for that. Also the technology for that lab was supposed to be almost 30 yrs ahead of what we have now. So I designed the interfaces while doing research on what I needed while on location in New Mexico. Luckily we had a coordinator on this film – Charlie Erlanger – who was able to keep track of all the elements and scenes we needed. He would also help make some of the animations when it was crunch time. There was a small team of designers working on this with me. Vince Parker was the programmer/designer on location with me, he would program all the files for set and to be interactive while I would design and animate them. Coplin LeBleu was back in LA designing elements for the shots coming up in the schedule that we couldn’t get to while on set. The sets of “Transcendence”. Courtesy of Chris Kieffer. And here I’d like to thank Chris Kieffer for taking the time out of his prolifically busy schedule and answering a few question I had about his craft, and for sharing the illustration materials for the interview. His latest production, Transcendence, is playing in theaters now, and widely anticipated Interstellar will be out in theaters in November 2014.